With Campaign Logger you need never forget an important detail in your games ever again. Roleplaying Tips are kindly donating 3 Lifetime Licenses as prizes for this years convention so that you can become the GM you've always dreamed you can be, if only you could remember those pesky little details between sessions. Campaign Logger is the fastest, easiest way to take session notes and be the most organized game master you've ever been. Clean and simple, Campaign Logger lets you rapidly type in session notes without distraction at the game table. Then the app magically carves up your notes into NPCs, Locations, Items, and Plots, so you can find your notes anytime as fast as a quickling with Boots of Speed. The special tagging system means you can find any campaign detail with one or two clicks. And unlike other methods, Campaign Logger brings back all the notes you quest for with full context. It's got to be experienced to fully understand the power of the design, but I can only describe it as 3D note taking. Veteral GM Johnn Four offers numerous courses on running better games via his site at Roleplaying Tips. 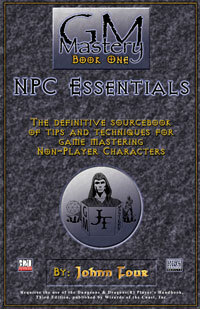 Courses available include NPC Essentials which is an 84 page book on mastering the art of better NPC's in your games, or perhaps combat is slowing down your games? Why not try How to Make Your Combats Twice as Fast (and how to make your stories gut-wrenchingly glorious at the same time), a full 52 week course with coaching and step-by-step instructions. With this Roleplaying Tips are giving away 3 life time memberships to Johnn Four's Adventure Building Course.